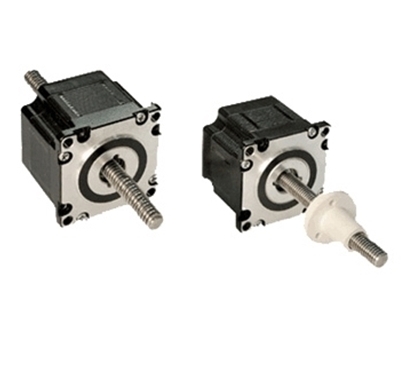 1 amp rated current, 1 Nm holding torque Nema 23 size stepper linear actuator is available in non-captive, external shaft options. The special design and material of the nut secure long life operation. This 2 phase Nema 23 frame size hybrid stepper motor linear actuator in a very small package, rated current of 2A and holding torque of 1 Nm, precision leadscrew and special nut design, make it more efficient and more durable. Very compact 2 phase stepper linear actuator in size Nema 23 (57mm) with high positioning speeds, short positioning times and high thrust and drag forces. 1.2 Nm holding torque, non-captive and external linear versions can be delivered. 4 amp 2 Nm cheap price stepper motor linear actuator comes in Nema 23 frame size, special nut design and higher IP protection. It not only reduce cost but also reduce failure rate due to the less number of components and more simple construction. 2 phase 4 wires 1.8 deg. step angle Nema 17 stepper motor linear actuator with 1.33A rated current, 152 mm length lead screw, provides up to 30 Oz-in holding torque. 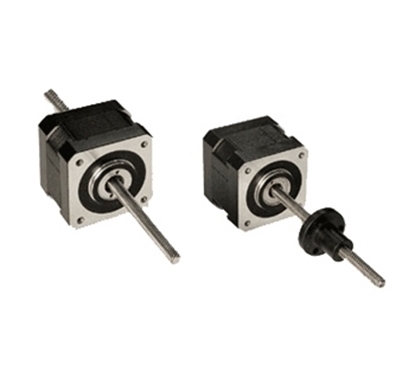 Non-captive shaft and external shaft motor style are available. 2 phase Nema 23 stepper motor linear actuator providing holding torque of 1 Nm, current per phase 1A. It is widely used in many applications such as X-Y tables, optical scanning equipment, medical valve and pump equipment etc.. The stepper motor linear actuator can roughly be divided into two types according to the principle of the propulsive force in electromagnetic field, variable reluctance and mixed type. The former has the advantages of simple structure and low cost and its shortcoming is that the magnetic force is small, asymmetric and the torque fluctuates greatly. The latter is added with permanent magnet on the basis of the former. Therefore, even in the case of power failure, the permanent magnet can also generate a certain torque and can continue to run a certain distance in a straight line. The existence of permanent magnet can form a larger propulsive force in unit volume compared with reluctance. It can easily complete the micro-step control and has less dependence on the parameter in its control distance. The partitioning technique is usually used in the hybrid motor order to improve the smoothness of the linear motion and reduce the fluctuation caused by propulsive force.